Elizabeth Warren On Unclear Warpath To Impeach Trump. The Only Question Is How? The opinions expressed by columnists are their own and do not represent the views of Townhall.com. Popcorn Lung, Formaldehyde, and Now Seizures, Oh My! After two years of lectures about “principles” and “the Rule of law” by the establishment-loving hacks furious that normal Americans rejected them and elected Donald Trump, their performance last week demonstrated that their high-minded dedication to conservatism is all a fraud. It’s not about “principles” or “the Rule of Law.” It’s only about holding on to power – theirs. Let’s take the latest in a seemingly endless series of #fails from that smarmy dope Paul Ryan, King of the Fredocons. First, he rushed to help out the liberals with their ridiculous narrative about how Donald Trump is a “Nazi” (Wait, I thought the narrative memo had him being a Russian fifth columnist – damn, our president sure is versatile!). You couldn’t keep Ryan from eagerly jumping in with his usual more-in-sorrow-than-in-anger-about-Trump thing to help the left push its latest meme. Antifa though? Not so fast! Ryan, the poodle that he is, obediently waited until Nancy Pelosi led the way and offered some tepid words about these commie blackshirts and their thirst for blood before Brave Sir Ryan ran out and offered some tepid words about these commie blackshirts and their thirst for blood. Paul Ryan is a guy who can’t even take his own side in a fight – or, more to the point, our side in a fight. Now, a quick quiz: When Donald Trump proposed to keep his promise to the Republican voters who elected him and end the unconstitutional DACA program that the Obama administration enacted to ignore duly-enacted immigration laws, what did Passive Paul do? A. Ryan immediately offered his support for the president undoing this Rule of Law abomination that Ryan expressly called “unconstitutional” on Fox back in October 2014. B. Ryan immediately demanded the president not undo this Rule of Law abomination that Ryan expressly called “unconstitutional” on Fox back in October 2014. C. Ryan immediately asked someone to explain what the phrase “keep his promise to the Republican voters who elected him” means. 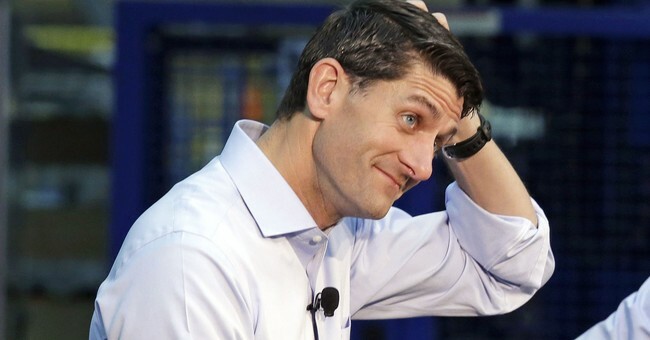 So, for the benefit of us suckers, basically Ryan was against DACA when it couldn’t be undone, but is now panicking when it can be undone because it might actually be undone – unless President Trump lets Ryan roll him, in which case he deserves to be laughed at in exactly the way his Never Trump enemies will laugh at him. Gosh, this DACA two-step kind of reminds me of Obamacare and how gung-ho the True Conservatives were to repeal it when they couldn’t repeal it and how suddenly they turned ungung-ho when they actually could. Weird. If I was cynical, I’d say that it seems like the establishment GOP has been lying to our faces for years and years, but that couldn’t be true because our establishment betters have principles and stuff. Of course, it’s not just the Wisconsin Wimp shifting into conservagimp mode. Soon-to-be-former Senator Jeff Flake, that braying doofus, naturally joined the cave-in chorus. Ben Sasse, Flake’s braying doofus doppelgänger, probably joined in, but I refuse to spend valuable time looking at his tedious Twitter feed to find out. And since it involved betraying Republicans, you have got to assume John “Blue Falcon” McCain is in on it too. Yeah, because “principles” and stuff. Because enforcing the law is the most important thing there is, except for doing what the rich guys who fund the establishment want. That’s really the most important thing. Yeah, so after nearly two years of tiresome finger-wagging about “the Rule of Law” and how we need to put our “principles” above our desire for “winning,” the whole sordid scam we always knew it always was is revealed for the world to see. They can’t hide it anymore and they aren’t even trying. Their glorious “conservative principles” aren’t principles at all but a skeevy ploy designed to tie our hands and keep us from pursuing policy goals our establishment coalition partners disfavor. They want open borders. They want illegals. They want cheap foreign labor that doesn’t get uppity to man their donors’ corporations so the Captains of Crony Capitalism don’t have to fuss with American workers who won’t tolerate being treated like chattel. Yeah, “we’re better than that” all right – if you mean that we are better than enforcing the laws the American people passed through a constitutional process if the ruling class decides it doesn’t like them. “The Rule of Law” is for us, not for them. “The Rule of Law” was supposed to be a shield to protect us from the ravages of the powerful, but our Truer-Than-You Cons use it as a sword to cut our legs out from under us and keep us from defending our own interests. Oh, you can’t possibly exercise the power against our leftist enemies that they always exercise against you. Because principles. Oh, you can’t possibly be uncouth and actually fight back against our enemies. Because principles. Oh, a principle is getting in the way of something the establishment wants? What’s a principle? So now, suddenly, Congress is moving to try and keep DACA alive through – gasp! – legislation, though that’s probably not going to happen since most GOP legislators understand that amnesty is ballot box poison. See, that’s why they loved DACA – they can’t pass it as a law, so they simply feigned outrage for the benefit of us rubes when Obama did exactly what they wanted with his pen. And in the most Congressional GOP move of all possible Congressional GOP moves, they now want to try to pass a proposed DACA fix using Democrat votes and so their proposed deal to the Democrats – who really, really want 800,000 future voters – is to trade it for…wait for it…still waiting…nothing. The GOP isn’t asking for anything. No new limits on immigrants, no reform of chain immigration, certainly no wall. Nothing. I hope the dealer tries out this innovative new negotiation strategy on me the next time I bargain to lease a fine German sports sedan. Actually, the GOP does get something – shafted, as usual. Yeah, their deal is we give you Democrats what you want and, in exchange, you call us racists when Elizabeth Warren proposes to declare all these middle-aged Dreamer kids US citizens. Because, you know, they had dreams and stuff. Pathetic. You know, it’s becoming clearer and clearer that the real reason the Republicans don’t want to end the filibuster to allow them to pass legislation is that they would then be expected to pass legislation that their voters want and the GOP establishment doesn’t. This explains why we see the DC establishment unifying to protect its power and privilege – and holding us normals in utter contempt. Most Democrat senators and Republican senators have much more in common with each other than with us – to the GOP establishment, Trump’s clearly the bigger threat than a counterpart across the aisle. It also explains why you hear about Bernie supporters who went for Trump instead of Felonia von Pantsuit. That’s the fault line – the desire to keep or destroy this monstrous status quo. This new axis will reshape the political parties as their uncomfortable coalitions jockey for control of their respective party’s infrastructure (Yeah, the Dems have big problems too). Hell, it may reshape – violently – our whole country if we aren’t careful. It’s all just another lie. Book Review: How Were Passengers Dining on 'The Last Night on the Titanic'? CNN's April Ryan Says Sarah Sanders' Head Should Be "Lopped Off"
Townhall.com is the leading source for conservative news and political commentary and analysis.